We had an opportunity to visit the Poker Flat Research Range facilities during their 50th year anniversary. 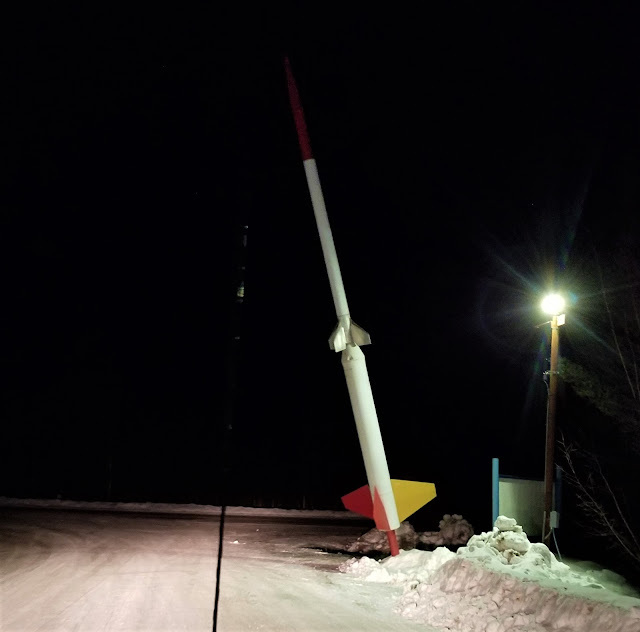 They have put out flyers to invite the community to come out 30 miles away from town on Steese hwy to celebrate the 50th year of Poker Flat Rocket Research Range with them. There was a free bus ride from University of Alaska Fairbanks (UAF) but when I called them to make reservations, the buses were already booked. I decided to drive there with my husband and my son. The road was great, barely had any snow on the road but it was dark out though. When we arrived at the Poker Flat Research Range, the parking lot was full. We had to park on the overflow parking area. The first building we got into is the Admin Center. There was a lot of people inside so we didn't stay long. We then went outside to wait for transportation to take us to the upper range facilities. The line was long and we were told they did not anticipate to have this many people show up there.